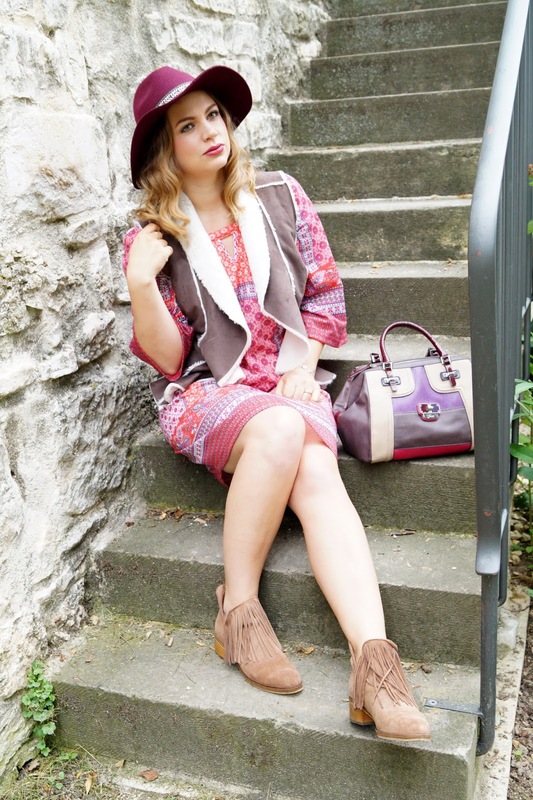 Indian Summer – shearling vest / colorful boho dress and fringe booties…. 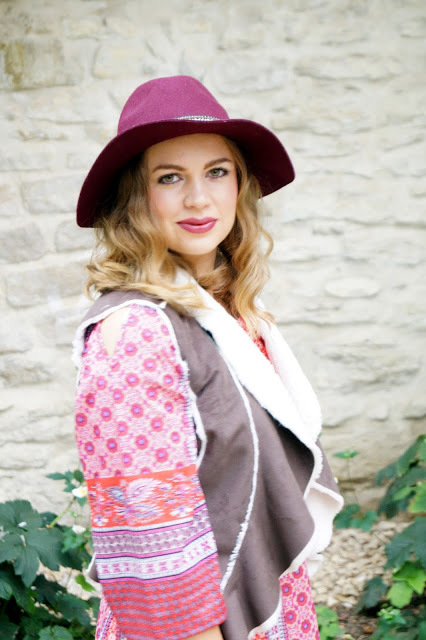 who doesn´t love a colorful dress with boho print in bold fall colors paired with a soft and cozy shearling vest for a crisp autumn day ?! I definitely do!! The colors of this dress are my favorite combination for fall. Orange and a rich burgundy shade. The dress used to be a summer dress but I think it is also one you can transition into fall. It is a cold shoulder dress so sometimes you can see the cutouts but that doesn´t bother me. You could easily pair a knitted cardigan with it. I took a felt hat in a burgundy shade of the dress which matched pretty nice. And how fancy are the fringe booties. I was searching for booties in this style for about ages (but without the fringes) and I love them. They are made of suede material and the fringes twirl with every step. Pretty cool. Also the color goes so well with so many different colors. We sleept in late today and I am so glad about that. After shooting three different outfits yesterday I have to do a lot of housework today. We also get some visitors for coffee and head out for chinese food for dinner.